Low temp. WHG tech. in cement industry means, in clinker production of new type dry process and by means of waste heat recovery facility-waste heat boilers, exchanging and recovering a mass of waste heat contented in cooler exhaust gas and preheater exhaust gas, and producing superheated steam to drive turbine which will transform heat energy into mechanical energy, and finally driving the generator to produce electricity to be used in cement production. In Aug.1995, China National Planning Commission and Japan NEDO signed a demonstrative project agreement for low temp. WHG and committed the project implementation to Conch Cement and KAWASAKI. The project construction started from Oct.1996 and began to generate electricity in Feb.1998. Since putting into operation, the WHG system has been running smoothly keeping a actual capacity of 7200kW. This WHG project for 4000tpd clinker production line of Ningguo Cement Plant Conch Group is the first low temp. WHG project in China and is very appreciated by China and Japan government and experts because of its outstanding social and economic benefit, and acts as a demonstrative positive role in WHG technology for new type dry process cement production in China. Conch, Persisting in innovating and popularizing WHG tech. 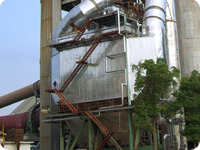 Along with related state policy for energy synthetically usage, the whole society has been passionately advocating the recycled economy development mode, and Conch Cement took the lead in constructing low temp. WHG on a large scale. By importing advanced Kawasaki technology and key parts of PH boilers, Conch and Kawasaki cooperated again to construct 10 sets of WHG projects with total capacity of 163MW for 18 clinker production lines in 7 subsidiary factories in Jan.2005. These WHG projects covered all kinds of clinker production lines currently possessed by Conch cement. Conch cement plans to finish the construction of low temp. 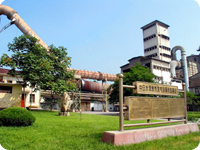 WHG system for all its clinker production lines during China Eleventh Five-Year Plan with expected total capacity of 500MW by the end of 2008. In cement clinker production, heat utilized for burning clinker is only of 60-70% of those generated by fuel. By flushing tech., the thermodynamic system can realize high efficiency of heat recovery. By increased steam superheating degree, the system can recover utmost low quality waste heat , achieve outlet gas temp. as low as possible. 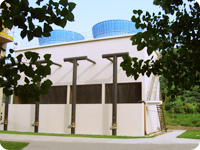 The system can recover 20-30% low quality waste heat more than other system. According to different thermodynamic system, mixed steam type low parameter condensing turbine/generators are designed and developed to increase relative internal efficiency and finally increase output capacity. The turbine is controlled by DEH system. Based on a 5000tpd clinker production line, the actual capacity can reach 9500-10000kW. Horizontal PH boiler can ensure high heat exchange efficiency by mechanical hammering dedusting device, and needs less maintenance work compared with vertical boiler. Adopted above mentioned technology, and together with necessary modification of cooler, the WHG system can operate smoothly, and is adoptable to severe fluctuation of kiln system, meanwhile can ensure long term simultaneously operation of both WHG system and rotary kiln system. Based on own advantages, importing key technology and by means of tech. 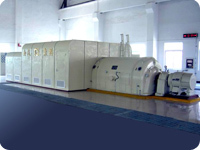 cooperation, Conch vigorously developed and optimized key equipment and realized waste heat boiler localization, and developed non-standard multi-stage mixed steam type low parameter condensing turbine/generator, and can realize modular design and integrating according to different kiln type. Independent engineering and integrating, including civil, process, thermodynamic system, water supply and drainage, and electrical. Independent DCS programming, and DEH system developing and designed for turbine. Optimized equipment configuration, reasonable parameter selection and standardization. By means of above mentioned integrated innovation mode, the WHG system can combine perfectly the world wide advanced tech. and domestic well-developed tech., and the independent developing ability is formed. With low investing cost and promoted operation benefit, the system can realize a payback period less than 3 years.